API usage patterns, such as by apps, by geographic region, or by users. The Envision product does not require any prior understanding of what the data it analyzes represents. It does not require any business understanding. It can analyze data from any business domain because it works using general analytical concepts. The foundation for analytics is understanding and defining what data you have to work with and what you want to do with that data. This is what is done with the data definition capabilities of Envision. Then the data must be collected. Envision at its core does not reach out to different business systems to collect data. Instead it provides a data storage API for clients to push the data into a highly scalable Envision data store. Connectors are then provided that are domain specific to extract data from different business systems and use the Envision data storage API. One such connector is provided by Akana Policy Manager which enables the extraction of business specific data from payload and stores it for future analysis. The use of the Envision data storage API is optional. Alternatively data can be saved directly to the Envision data store if access is permitted. Envision also supports data enrichment during the storage process. This is the amending, or altering, of data before it is persisted based on information obtained from a different source. For example the business system might be just collecting the user-agent field but for proper charting the corresponding browser/OS/device may be what is persisted instead. Enrichment is performed by plugins invoked by the data storage API prior to persisting the data or by scheduled jobs to manipulate data not persisted through the API. Based on the data definition raw business data must be transformed into metrics that can be compared, charted, and trended. This is done by organizing, or grouping, the data in ways that can be queried with the proper granularity and purpose, and performing aggregating calculations on the data according to those groupings. For example calculating the average sales figures of each channel partner on a quarterly basis. This is what the Envision data aggregation capabilities provide. Finally users of Envision want to view the aggregated data in ways that easily depict the trends, patterns, and violations they are looking for. 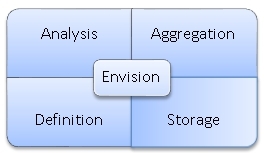 Envision provides analysis capabilities for the user to do this. Envision does this through a highly tailorable charting and dashboard generation portal. It can also support the extraction of data through the use of an API so that third party visualization tools can be used. 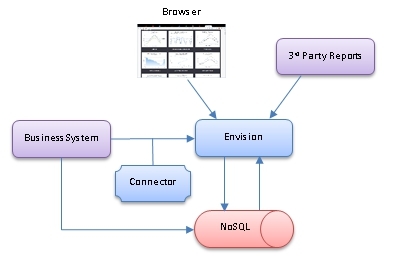 The following illustration shows how Envision would interact with users and other systems. Envision stores all data in a NoSQL database. Connectors extract data from business systems and call Envision APIs that store the data in the NoSQL database. Envision performs the needed aggregations on the data in the NoSQL database. The data is then available for viewing in a browser using the Envision web application in user designed dashboards and charts. Alternatively a Third Party reporting product can query the data from Envision.